Whether your child has a fashion doll like Barbie, or loves American Girl or baby dolls, they will need new clothes to fill their dolls' wardrobes. Try your hand at these outfits for both an 18" and 21" fashion doll. Each pattern will help you learn to sew in smaller scale, and if you work together with your child, you can teach her the basics of sewing. Sewing doll clothes is a great way to use up fabric scraps or make matching outfits for your daughter and her miniature friend. The patterns for this outfit will fit a Karito Kids doll, but can easily be modified for an 18" doll. For the leggings, simply measure the inseam of your doll. Use this measurement, plus 1/2" for the hem, to cut out the fabric legging pieces. The swing top pattern can be left as is to become a dress for an 18" doll, or shorten the bottom edge for a top. 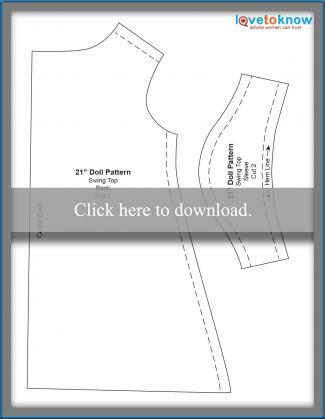 Click on the pattern image below to download and print the 21" doll clothes pattern pieces. Click to download the patterns. Use an old t-shirt to make these leggings, or swap it out for any fabric that has some give to it. Cut out the patterns from the printable copies. Tape the Legging Part 1 pattern to the Legging Part 2 pattern. Cut out all fabric pieces as indicated on pattern pieces. Fold 1/4" on the bottom edge of one legging piece to the wrong side and press. Fold another 1/4", press and pin. Top stitch the folded edge to hem. Repeat on the other legging piece. Place both legging pieces together with the wrong sides facing out. Pin the front seam edges and the back seam edges. Sew each pinned edge using a 1/4" seam allowance. Note: To help keep track of the front and back sides of the leggings, place a safety pin on the back seam. Sew the front and back seams. Open the leggings and shift with the front and back seams running vertically in the center. Pin the bottom of the front and back seams together. Pin the inseams. Sew the pinned edges using a 1/4" seam allowance. Sew the inseam and crotch. Fold down 1/2" to the back of the waist, pin and press. Starting on the legging's back seam, sew around the pinned edge, leaving a 1" opening. This is the casing for the waist. You can now remove the safety pin marker from the leggings. Cut a 10" length of 1/4" wide elastic. Attach a safety pin to one end of the elastic. Insert the pin into the casing and thread the elastic around the waist. Overlap the ends by an inch and stitch together. Stretch the waist to pop the stitched ends inside the casing. Sew the opening in the casing closed. Use a pretty patterned fabric to make a swing top that will match the leggings. Fold 1/4" on the center-back edge of one swing top back piece to the wrong side and press. Fold another 1/4", press and pin. Top stitch the folded edge to hem. Repeat on the other back piece. Lay the swing top front on your work surface with the right side facing up. Place the swing top backs on top of the front. Match and pin the shoulders. Sew the pinned shoulders using a 1/4" seam allowance. Open the stitched top and press the shoulder seams open. Fold 1/4" on the edge of one sleeve to the wrong side and press. Fold another 1/4", press and pin. Top stitch the folded edge to hem. Repeat on the other sleeve. Pin the curved edge of one sleeve to one curved arm opening with the right sides together. Sew the pinned edge to attach the sleeve. Repeat with the other sleeve. Attach the shoulders and sleeves. Fold the top with the front and back together and the right sides facing. Match and pin the side seams from the hemmed edge of the sleeves to the bottom of the swing top. Sew the pinned edge using a 1/4" seam allowance. Turn the top right side out and pin. Pin 1/2" wide single-fold bias binding to the wrong side on the bottom edge. Note: Do not unfold the back of the tape. Sew the pinned tape using a 1/4" seam allowance. Trim the seam to a scant 1/8". Fold the tape to the front of the top, press and pin. Top stitch the pinned tape. Attach bias binding to the neck opening in the same way. Attach bias tape to hem and neckline. Cut a 2" length of 3/4" wide, sticky-back Velcro tape. Peel away the backings from both sides of the tape, but do not pull the tape halves apart. Place the tape on the one side of the center-back at the top. Place the edge of the other center-back over the tape. Squeeze firmly with your fingers to secure the adhesive to the fabric. Pull the halves apart to open and close. Note: If you prefer to sew the Velcro tape, do not use sticky back tape. The patterns for this outfit will fit an American Girl doll, but can easily be modified for a 21" doll. Add an inch or two to the length of the skirt portion on the sun top. This will provide the coverage needed over the midsection. The jean shorts can be left as is, but they will be a lot shorter on a 21" doll. Add an inch or two to the length if you prefer the hem to be at the knee. 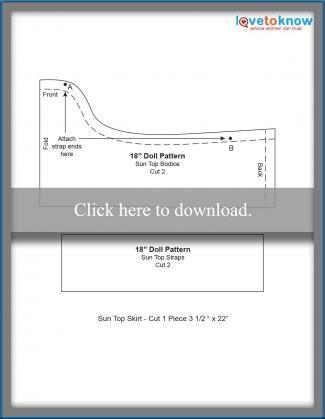 Click on the pattern image below to download and print the 18" doll clothes pattern pieces. Create a pretty sun top with patterned fabric and pretty accents. Or, choose a plain fabric with eye-catching buttons and trim. Fold one strap in half with the right sides facing and the long edges matching. Pin the long edges together. Sew the pinned edge using a 1/4" seam allowance. You now have a little tube. Turn the tube right side out and press. Repeat with the other strap. Tip: Turning such a small tube can be quite a chore, especially if you are using a thick fabric. Simply fold 1/4" of the long edges to the wrong side. Fold the strap in half with the wrong side together, matching the folded edges. Top stitch the folded edges together to complete the strap. Lay one bodice piece on your work surface with the right side facing up. Using the pattern as your guide, place one strap end over one "A" mark with the remainder of the strap hanging down. Place one end of the other strap over the other "A" mark in the same way. Lay the other bodice piece on top, matching the edges. Pin the sides and the top edges of the bodice together. Sew the pinned edges using a 1/4" seam allowance. Clip the curves, turn the bodice right side out and press. Fold 1/4" of the the bottom edge to the inside and press. Set the bodice aside. Fold 1/4" on the short sides and bottom edges of the sun top skirt piece to the wrong side and press. Fold another 1/4", press and pin. Top stitch the folded edges to hem. Set your sewing machine to a basting stitch, or the longest stitch available. Sew along the top (un-hemmed) edge of the skirt. Leave long tails on each end of the stitch line. Separate the tails on one end and tie in a knot. Pull the top tail on the opposite end to gather the skirt edge. Prepare the bodice top and the skirt. At this point your bodice looks the same on both sides. Choose which side will be the front. Insert the gathered edge of the skirt between the folded edges on the bottom of the bodice and pin. Top stitch along the pinned folded edge to attach the skirt. Pin the other end of the shoulder straps 1/2" below the bodice edge at the "B" marks. Careful not to twist the straps. Place 3/8" buttons over the pins and hand sew in place. Remove the straps. This will attach the buttons as well as the straps to the bodice. Place buttons over the bodice, just below the edge on the front in the same way. Choose a rick rack that coordinates with your fabric. Top stitch the rick rack over the hem of the skirt. Attach buttons and rick rack. Cut a 3/4" length of 3/4" wide, sticky-back Velcro tape. Peel away the backings from both sides of the tape, but do not pull the tape halves apart. Place the tape on the one side of the back bodice opening. Place the edge on the other side of the opening over the tape. Squeeze firmly with your fingers to secure the adhesive to the fabric. Pull the halves apart to open and close. Note: If you prefer to sew the Velcro tape, do not use sticky back tape. Turn your old, torn jeans or jean shorts into a miniature version for your child's favorite doll. The sewing instructions for the jean shorts are done in the same way as the above legging instructions, including using a 10" length of 1/4" wide elastic. Sew front and back seams, inseam and crotch. Finding free 21" doll clothes patterns can be difficult, but you will find an abundance of 18" patterns at no charge. Dolls of both sizes have very similar measurements and in most cases an 18" doll pattern will work just fine for a 21" doll. If making pants, skirts or long sleeved tops, add length to 18" patterns to custom fit a 21" doll. For more specifics on doll measurements, check out the measurement chart on Pixie Faire. These patterns are all free and offer lots of options for your fashion-forward dolls. For a little more sophistication give this Chloe dress from Imagine Gnats a try. This project would be better suited for an intermediate sewer as the lining could prove a bit tricky for a beginner. You will want to lengthen the skirt portion of the pattern for a 21" doll, and if you decide to add long sleeves, measure from shoulder to wrist (plus hem) for the sleeves. Fleece Fun has certainly delivered a "fun" pattern with these boutique style pants for your 18" doll. The ruffled cuffs will show off your little friend's personality. This is an easy pattern that can be altered into several different styles. Omit the ruffles for capris, shorten for shorts, or measure your doll's inseam for long pants. Skip to My Lou offers an 18" doll dress pattern that resembles a pillowcase dress and would be precious with a matching dress for your little girl. This is a very easy pattern and could be used as a teaching pattern for your child. Lengthen or shorten the pattern for a top or dress to fit either your 18" or 21" doll. XOXO Grandma doesn't even require you to download a pattern for this adorable skirt tutorial. It is made using a lace doily. This project is quick and suitable for a beginner to sewing. The size of the doily will determine what size doll it will fit. Free patterns in this size can be difficult to find, but if you don't mind spending a few dollars, you'll find plenty of adorable outfits to sew. Liberty Jane offers two free tank top style patterns for the 21" Karito Kids dolls. One tank is a common Tank Top style, while the other is called a Strappy Tank and resembles a Camisole style. Each pattern is suitable for a new sewer to achieve success. This sweet, cropped jacket, also by Liberty Jane, is available at Pixie Faire for $3.99. Not a bad price, but the pot is sweetened even more with the inclusion of the dress pattern as a free gift. The skill level for this pattern is stated as easy. Love U Bunches offers a trendy summer sundress that can be made long or short. This pattern is also $3.99 at Pixie Faire and it is suitable for beginners. If you're looking for different sizes for popular dolls, these patterns are all fun choices. You won't be able to resist the cute and quick peasant dress tutorial for a Cabbage Patch doll found at Alida Makes. This is a "must-do" project for Christmas gifts as she states 3 or 4 can be made in an hour with her basic pattern pieces. This is an easy pattern suitable for a beginner to sewing. When One Little Project purchased a Baby Alive doll for her daughter's 3rd birthday, she couldn't help but make a few diapers to go along with it. This is a very easy pattern that can be used for Baby Alive, Cabbage Patch and other similar baby dolls and stuffed animals. Finally a pattern for Barbie that is more conducive to real life. It's an apron shared by Brassy Apple. She thought of everything with this contribution. Not only is the project easy, but she used elastic hair bands for the neck and waist ties so little fingers wouldn't need help with dressing their doll. She also added a bit of tulle ruffle to the bottom edge, because even realistic accessories could use a touch of glitz now and then. You will be the coolest mom, grandma, godmother or aunt when the special recipient opens a box with a new wardrobe for her doll. Even if you only have a few basic patterns, changing the fabrics and embellishments will create a new and customized outfit. Most clothing pieces can be made in a short amount of time. The best part is that the dolls do not grow so the measurements will never have to change.